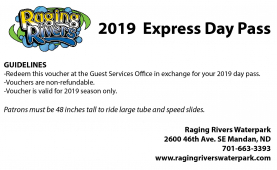 Click here to purchase your 2019 Season Pass! 2019 season passes are available! Season passes include access to the lazy river, tube and speed slides and aqua play unit! Host your birthday party at our place! Reserve your 2019 summer birthday party today. Reservations can be made online or by calling 663.3393. Did you know you can now print your day passes at home? Spend less time in line and more time playing by printing passes right from your computer. Raging Rivers Waterpark features tube slides, speed slides, a lazy river and a brand new Aqua Play area. It is four acres of wet and wild fun! A free-flowing man-made endless river with everything from calm relaxing waters to thrilling waves…so jump aboard an inner tube and float around this 800 foot waterway. This interactive water play area features a 500 gallon dump bucket! Installed in 2015, the unit boasts 60 plus opportunities for children and adults alike to enjoy the water. Additional features include tipping cones, bubbler jets, hose jets, pipe calls, pull ropes, water curtains, geysers, water cannons and water slides designed with the little ones in mind. Families love this attraction. The little members of the family will spend hours exploring all the different interactive elements. Turn a wheel, pull a knob, and push a lever and something fun and wet happens. Standing 66 feet above the park, the two speed slides provide the ultimate thrill for park guests to enjoy. Take the plunge, as you start off in total darkness and when you see daylight, you drop straight down in what feels like total free fall. You will scream as you speed down the double drop speed slide; each drop gives you the thrill of being airborne. Guests must be at least 48 inches tall to ride this attraction. Grab a tube and splash down the 45-foot high Raging River Rapids, where water rushes over your body with each curve and bend of the slide. Enjoy the white water rafting experience as your tube plunges over dips and curves in the rapids, spiraling you down to a big final splash into the landing pool. Note that we do require guests to be 48 inches or taller to ride the tube slides. Addiitonally, double tubes may not exceed 400 pound combined weight. Climb aboard a single or double inner tube and rocket down the 45-foot high Black Hole Tube Slide. Twist and turn, splash and slide in total darkness. You will emerge into daylight as you enter the catch pool. The ride is sheer exhilaration. Note that we do require guests to be 48 inches or taller to ride the tube slides. Additionally, double tubes may not exceed 400 pound combined weight. Click here for a list of Raging Rivers FAQs.